When I think of paper dolls, it reminds me of my childhood. Every girl I know has a piece they treasure in their hearts. The feeling of choosing which paper dress fits right in to your paper doll and trying on every piece for you to see which one looks better, isn’t that the sweetest dilemma we had back then? 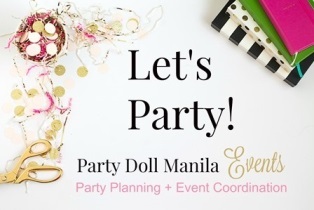 For Summer’s 1st birthday party, Party Express made sure that they gave us something to reminisce from the past so that the new generation today will have an overview and appreciation of what our beloved paper doll is all about. Care to join us as we check out the details of Summer’s charming bash? Guests were given a sneak peek of what to expect inside – 100% pure loveliness, of course! For their stage setup, Party Express brought back the feeling of nostalgia with its unique and memorable execution of what a real vintage party is. Complete with a dresser and different dainty pieces wonderfully showcased in this bedroom-inspired set, the two life-sized paper dolls and their OOTD hanging at the back made everything Pinterest-worthy! Pastel paper lanterns and drapes were used to inject a lively ambiance to the venue’s ceiling. Each table got an adorable paper doll to match the theme. Paper medallion and pretty florals were also used to complete the shabby chic look they were aiming for. Kids get to sit down on these plush pillows while being entertained by the puppeteer. There’s Cotton Candy and Popcorn carts available for them to munch on too. Who wouldn’t love Summer’s stunningly sweet cake? Carlyn Villarias did such a fantastic job bringing the theme to life with this sugar art! This gorgeous dessert tablescape by The Cake Room was my favorite! For Summer’s 2nd cake, see this doll house cake looking every bit of an eye candy. Even their cakepops, cupcakes and sugar cookies were too good to eat. As a treat, kids get to go home with these tote bags filled with more goodies. Here are some of their lovely family photos.